these cycles and rhythms as loving messages from the planet itself? We can be conscious of this eco-creative relationship. Today, I spend a significant amount of time with beekeepers and urban growers, so I hope the following highlights of my life have relevance to your current healing process and choosing your life coach. Spiritual awareness, soul connection, empathetic sensitivity, reliable intuition, feeling into the rhythms and cycles of an open creative channel are blessings with me since birth. As a result, I have always had a trustworthy inner compass. Whether or not I chose to use this compass in every area of my life is another issue; I have not -- and I have paid the price of painful, difficult learning many times. I am grateful for these experiences. However, at this point in life I am rarely off my path for more than a few minutes. I have not had the experience of feeling completely lost, and disconnected from the source of my life in several decades as my experience and expression of human consciousness continues to be refined. That said, in 1979, I gave birth to my second son, Max. Max is a miracle baby because in 1973, I was diagnosed with pelvic inflammatory disease resulting from use of an IUD following the birth of my first son, Seth. Both of my fallopian tubes were completely blocked with scar tissue from this low-grade infection. My doctors explained that I could not get pregnant again without surgery. With surgery, my chances of a second successful pregnancy were less than 20% while I would become high risk for a tubal pregnancy, which can be life-threatening. Unbeknownst to me, the pelvic infection compromised my immune system so that an opportunistic fungus infection was introduced into my system through a partially erupted wisdom tooth (so symbolic). Twenty-three years old, mother of a three-year old son, I was wasting away with an unexplained illness. At this time, I spontaneously began to meditate. In these meditative times, I asked whatever it is that creates me why I was facing death. Slowly but surely, answers came and while they were given with love they were often uncomfortable to face and receive. I continued listening, and the process of inner work I eventually shared with my healing students came as a gift. As a result, I connected with a family doctor who diagnosed my illness. After a year of taking very heavy duty medications, the systemic fungal infection was vanquished. As I recovered from two years of illness and being near death, I took the information coming from my body and used it to changed my life. The process now widely known as "visualization" was given in meditation, and I healed my infertility condition with the scar tissue falling out in one clean, clump. A year later, Max was born without complications. However, my challenges were not yet over. When Max was a year and a half, I had a horrifying dream in which it was made known to me that Max was about to be very sick and that the root cause was a past life relationship. Within a week, Max manifested the first symptoms of Juvenile Rheumatoid Athritis. Having been forewarned and having been through my own healing process, I was well prepared to accompany Max on his healing journey. Following inner guidance about nutrition and food with trust, even when the information didn't conform with allopathic medicine, Max's physicians gave Max a clean, arthritis free evaluation just four months later. There were a few years of time to build a stable family life with two children. But when Max was nine years old and my older son was eighteen, I needed a vacation from my freelance court reporting business. I attended a retreat in Charlottesville, Virginia, curious about the dynamics of several out of body experiences. During this retreat, I experienced an unsought classic Kundalini awakening. I had no idea what was happening to me, but I remained calm and curious about the process -- which was extremely fortunate in terms of being able to integrate the experience over many years. I have been facilitating transformation of consciousness as a healer and spiritual counselor since that Kundalini Awakening in 1989. Following this direct experience of the deepest quality of connection, my life radically changed -- again. Within a year my personal life was topsy-turvy. My marriage ended and so did my professional life as a freelance court reporter. My children's lives were up-ended, too, as the call of my life's purpose became my first priority. Two years later, In the fall of 1991, having become an ordained non-denominational minister, I surrendered to the purposeful power of the Awakening experience, a sweetly whispered intent manifesting the opportunity to travel to Moscow, Russia to "test" the healing abilities which spontaneously opened in and through my life and body. in Moscow, once having gained permission to work side-by-side with a number of Russian physicians, our creative collaboration resulted in stunning examples of the efficacy of hands-on energy healing. This experience is captured in the documentary "Heart to Heart: Energy Healing in Moscow, Russia 1991. Upon returning from Russia, I established a private healing and coaching practice. At this time, I launched Living Lessons: Heart-Centered Energy Healing a two year training program for hands-on healers. Physicians, nurses, therapists, psychiatrists and lay healers from Europe & the U.S. participated in this training. I created healing internship programs with American and Russian healers on subsequent trips to Moscow, Russia in 1992 and 1993. My first book, Everything You Need to Know Before You Fall in Love is the result of five years of using a personal transformation process that is still being used -- a life-long process of inner journeys, honest self-reflection held within an energy framework of the chakra system, and making consistently loving and healing choices as our intentional expression of outer action. From 1991 to 1998 I worked with hundreds of people, invited to sit on panels with Dr. Dean Ornish, Norm Shealy, Deepak Chopra, and the Dalai Llama's personal physician, incorporating travel across the U.S. and Europe, Israel and as far away as Brazil teaching workshops and leading transformation retreats as I continued with the two-year healing training and certification program I created. In 1998, once again following inner rhythms, impulses and changing cycles, I closed the healing training program and my private practice, returning to my own, ongoing personal healing journey. From 1998 through 2009, all of my focus was focused on healing primary family relationships -- just an ordinary person putting aside being clairvoyant, clairsentient and being able to literally see inside the human body as a medical sensitive. When I returned from my first trip to Moscow, friends, students and clients wanted to know when I was going to publish my book and follow the path of Deepak Chopra, and many others whom I have personally met, creating a more public persona. I knew the timing was not right, and so I have waited, once again, for the clear inner impulse that the time is now right to share my gifts and the wisdom of experience in balancing my life between the ordinary and the extraordinary without losing my way. So, this is my story, my journey. Here are testimonials from two of my students. I'm older and it seems wise to come out with my life purpose again in these extremely challenging times while people from whom I was "teacher" are still alive to corroborate the unfolding of my life's journey. Who would belief it, otherwise? My full life story is interwoven in my fortcoming book Tasting Beauty, Harvesting Wisdom: the Sweet Life & the Zen of Beekeeping. Today, having moved through major healing transformation in every aspect of my personal life, family life, & community life the inner journey and its rhythms and cycles have moved my purpose into conscious healing of our sick and deeply wounded Mother Earth. I am an urban grower and a beekeeper. I interact with kids, youth & adults to rekindle the spirit of respect and the responsibility to cherish our earth by making conscious choices coming from an accelerated awareness of our current planetary and literal cosmic cycles. In the past, I have been blessed to be guided by so many powerful teachers. The major teacher in my life today is the Deva of the honey bees -- their mother. She is frantically trying to get our attention so that her creation, her children are not forced to leave the earth forever because of selfishness, greed and a broken connection with the energies that sustain life itself, and our individual lives and the lives of those we love. I'm a beekeeper. I do my best to speak with Bee Deva's voice for her children, honey bees, whose life rhythms and cycles are the source of our food because of the invisible creative collaboration with the earth under our feet. 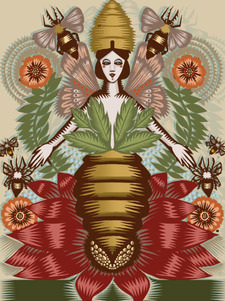 Conscious eCo-Creation is bee-ish! I would love to mentor you through my coaching program "Green Your Life." My VIP days which are the online channels for working personally with the tried and true inner process that saved my life forty years ago and contributes to transforming lives forty years later. I am committed to protecting the European honey bee and restoring habitat for honey bees and people, too. I believe this can be accomplished through education, advocacy and conservation of pollinators and healthy farm land. Please join me in this effort. Share this information. Become a hive sponsor. Visit the advocacy web site SlowBeekeeping.Org and support education/conservation through the Green Sanctuary Community Apiary web site.